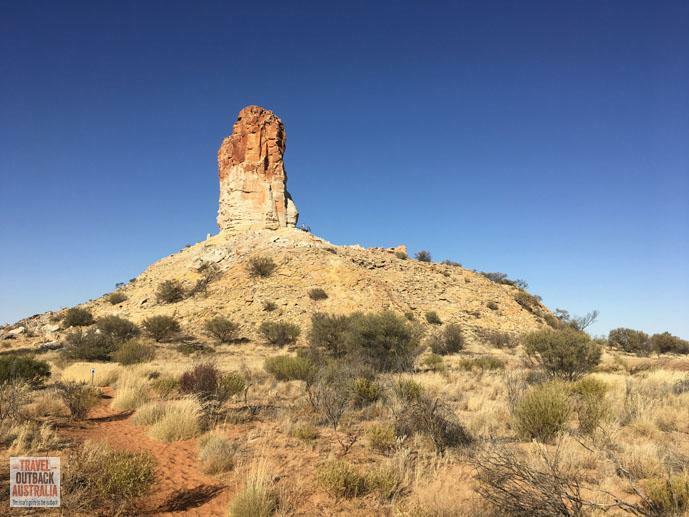 As soon as Chambers Pillar rises in the distance, you can’t help but marvel at its striking red and white walls, contrasting with the sky’s deep blue. 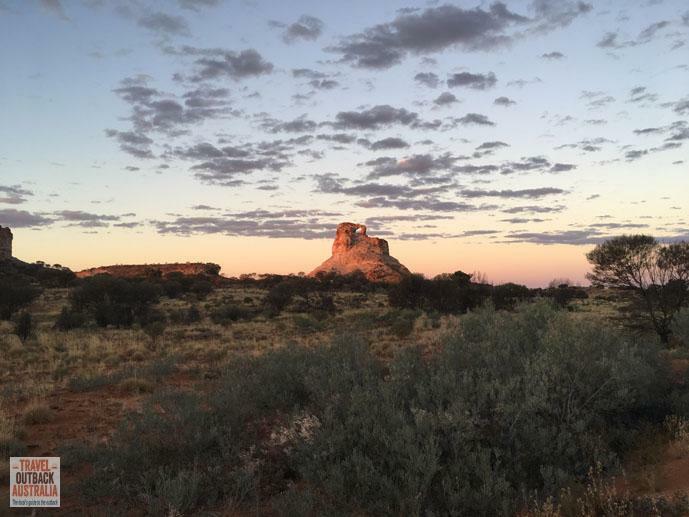 At around 150 km from Alice Springs, Chambers Pillar Historical Reserve is the perfect place to spend a night or two admiring the outback stars or just soaking in the serenity. In this guide, we’ll share what to see and do, what facilities you’ll find and how to get to this unforgettable, special place. Most people are drawn to Chambers Pillar Historical Reserve – Itirkawarra because of its famous rock formation. However, there’s not just one rock formation to see, there are in fact, three. 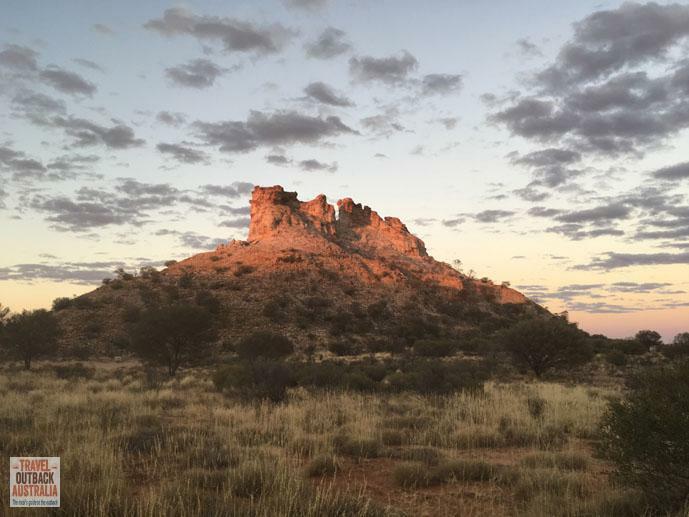 Each is a sacred site for the Lower Southern Arrernte, Pertame (Southern Arrernte) and Luritja people, who live in the area and jointly manage the Reserve today. As well, there are several short walks within the Reserve, along with photography, birding, natural history, and European heritage to discover. Around 340 million years Chambers Pillar, Castle and Rocks and many of the surrounding mesas you’ll see in the area lay on the shores of an inland sea. Layers of sand, silt and clay were deposited on the sea shores over time. The entire area was much higher in altitude than it is today, part of a vast plain that experienced seasonal heavy rains. Over time, this rainfall soaked into the ground, pushing iron pigments to the surface, and forming the hard, red ‘caps’ on top of the formations. The bottom layers were leached of their red colouring, leaving the white, grey and yellow colours you can see today. 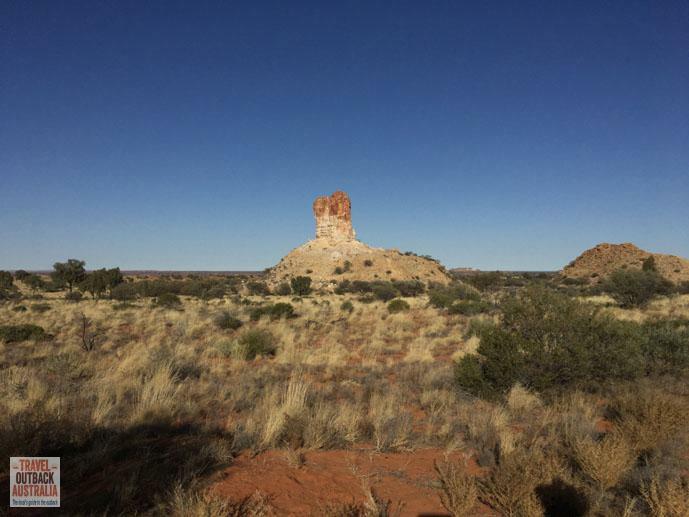 Wind and water eroded much of the plain away, leaving the iron-capped deposits in place to form the fragile mesas, breakaways and pillars you see today. If you’re a birder, then a visit to Chambers just after rain or in spring when the eremophilas and acacias are in flower won’t disappoint. 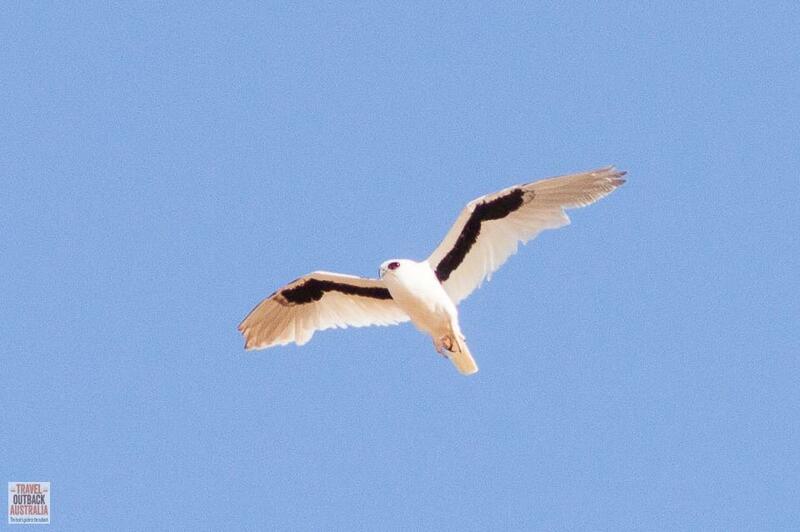 Uncommon birds such as the Letter Winged Kite, and colourful species like the Mulga Parrot can be seen, whilst at night, marsupial Spinifex Hopping Mice have been sighted here. It’s stating the obvious, really: Chambers Pillar is a ‘must-do’ place for anyone who’s into photography. It’s not hard to see why. Sunrise, sunset and star shots of the Pillar are the main attraction for most photographers. However, the two other striking formations, Window and Castle Rocks, are equally worthy of your camera’s lens. If you’re lucky enough to have a few clouds in the sky at sunset, then you’ll get some incredible captures. Clouds act like a natural filter, adding striking reds, oranges and pinks to the evening sky. There are two official walks at the Reserve – both are quite short and will not take you more than hour. The first walk is the one that climbs and circumnavigates Chambers Pillar. From the Pillar campground, follow the signs over a low dune – also a great place to stop and take in the vista. A set of 71 steps (Gary counted them) followed by a series of broad, flat steps made of natural stone climb the Pillar, leading to a walkway that hugs its northwest face. Here, you’ll get an eagle’s view of the surrounding plains and of the historic engravings. Though it’s tempting, please DO NOT add your initials or carve anything into the rock. Once you’ve descended the Pillar, turn right instead of returning to your car. A short, flat walk takes you on a loop behind the Pillar. Halfway along are a couple of seats that provide a perfect sunset seat to watch the changing colours. The second walk takes about a half hour, and leads you past Window and Castle Rocks. It starts on the eastern side of the access road, a couple of hundred metres back from the main car park/campground, and not too far from Castle Rock. Few people seem to take this second walk, so it really is a chance to get away if the Pillar campground is crowded, and immerse yourself in the desert’s sights and sounds. 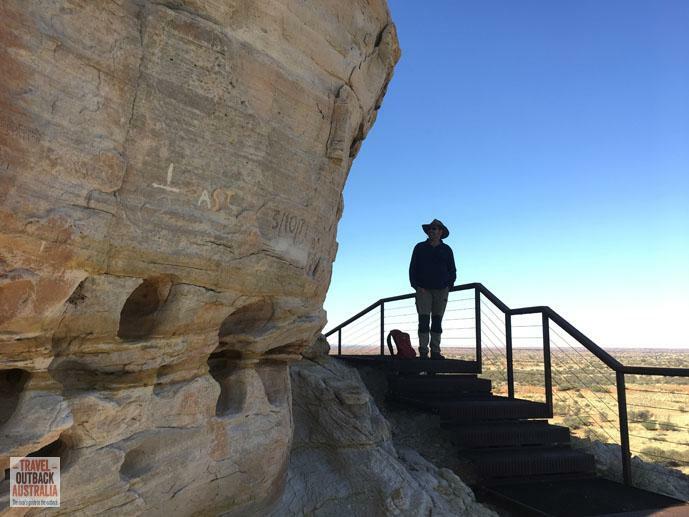 We’ve mentioned above that all of the rock formations in the Chambers Pillar Historical Reserve are Sacred Sites. This means they represent a Dreaming ancestor and are part of a Dreaming Story. Aboriginal people consider these Dreaming ancestors to be forever present and alive in the landscape, always acting out the deeds undertaken within the Dreaming Story. 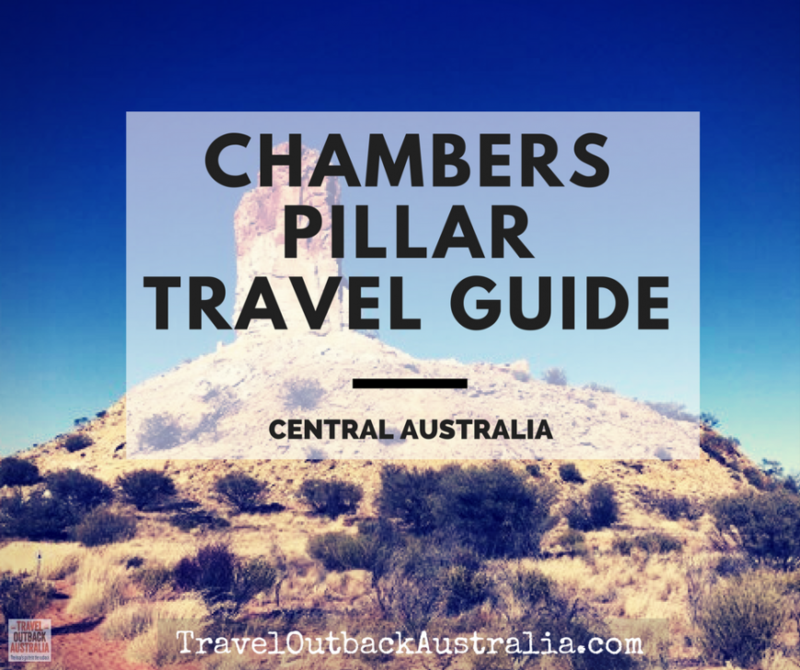 Southern Arrernte (Pertame) people call Chambers Pillar ‘Itirkawarra’. This is pronounced EYE-druh-kuh-worrah (roll the double ‘R’ as in Spanish). Much of the Law and story surrounding Itirkawarra and the other formations is secret, and can only be heard by senior Aboriginal men. However, a small part of the story can be heard by anyone. Itirkawarra was a knob-tailed gecko man who fell in love with a woman, Yayuwara, (represented by Castle Rock), who was his mother-in-law according to Arrernte kinship. This is absolutely forbidden. 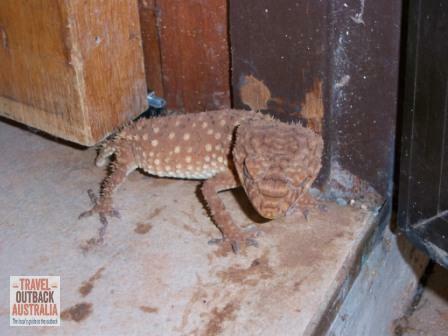 This is a knob tailed gecko. The couple refused to part, and were banished by their family and turned to stone. The first European to Chambers Pillar was the Scottish explorer, John McDouall Stuart, in early April, 1860. This was during his third attempt to cross the continent from south to north and find a route for the overland telegraph line, connecting Australia with Europe, Java and India. Stuart described the Pillar as a beacon, naming it after one of the benefactors of his expedition, James Chambers. 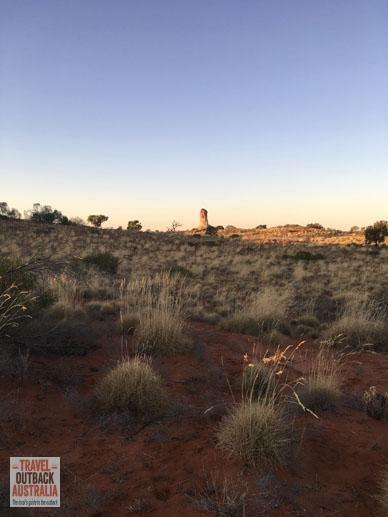 Following Stuart (who did not leave his initials in the Pillar), other early explorers, the builders of the Overland Telegraph Line and travellers to Central Australia used Chambers Pillar as a navigational landmark. 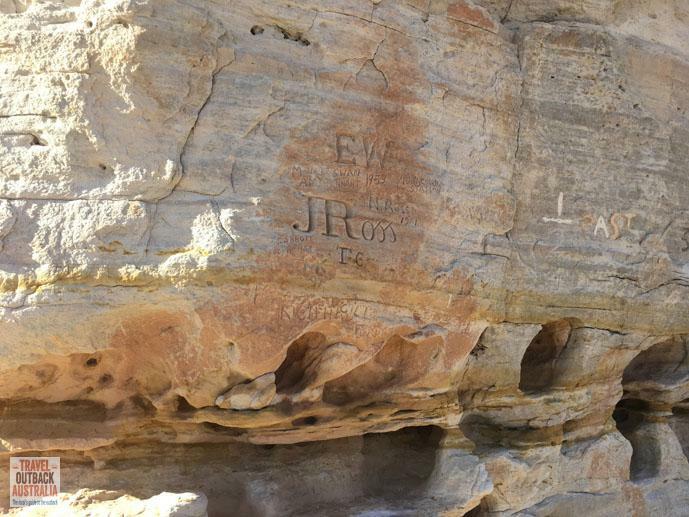 Many of them left their names or initials in the rock formation. Some of the early pastoral families, such as the Hayes and Murphy families, also left their names. Again, please DO NOT carve your name into any of the formations. Chambers Pillar used to have just one campground that got very crowded – especially with the ever-increasing popularity of camper trailers. Now, there are two campgrounds to choose from. The most popular campsite is the Pillar campground, which is closet to Chambers Pillar itself. There are about a dozen campsites, close together. A few have gas BBQs and most have fire pits. There’s also a long drop toilet. You’ll get stunning views of the Pillar here, but make sure you get here early for a spot (around 3pm). During winter, and especially during interstate school holidays, the Pillar campground gets very crowded. It’s also not really suited to camper trailers, which is why the NT Parks & Wildlife Commission made a new, larger camper a few years back. 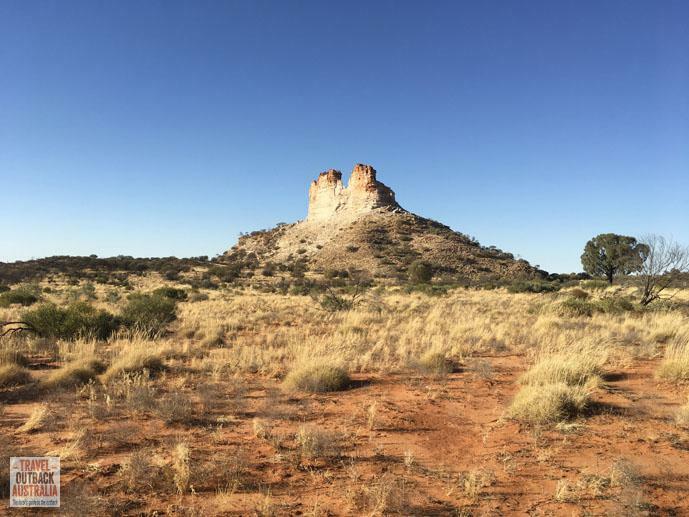 The Bush Campground is set further back from the Pillar but still provides great views of Chambers, and even better views of Window and Castle Rock. 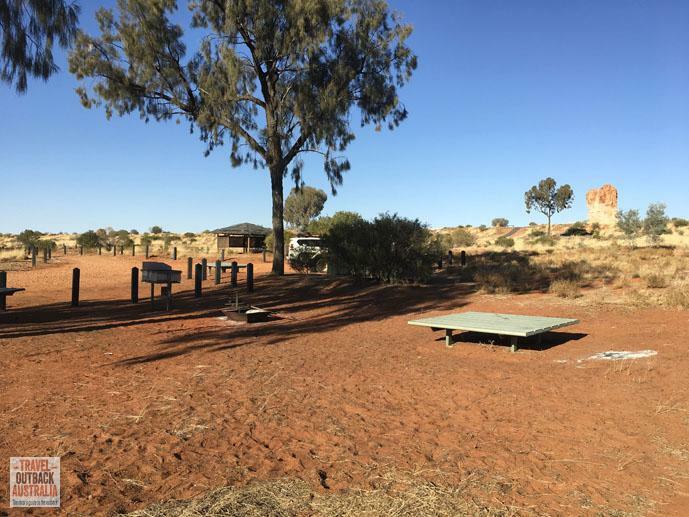 Designed with camper trailers in mind, the Bush Campground has about 10 large camp sites with fire pits set amongst the Desert Oaks and mulga. There is also a long drop toilet. 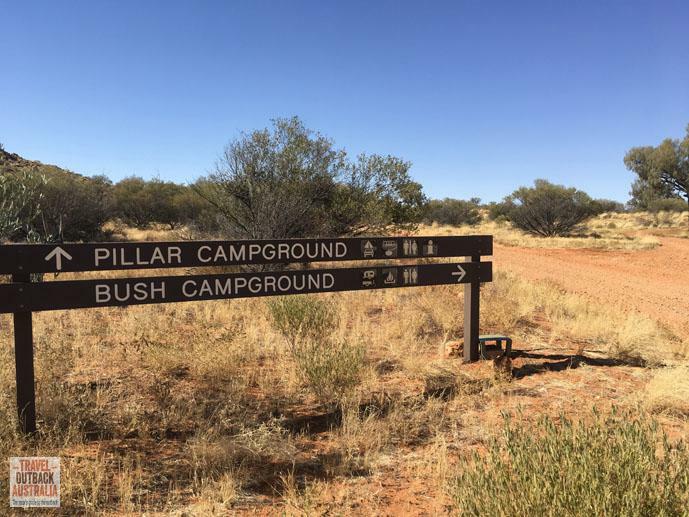 As there are NO water or rubbish bins at either the Pillar or Bush campground, you’ll have to bring your own water and take all your rubbish with you when you leave. Collect firewood before entering the Reserve. Good stands of mulga can be found on the roadsides approximately 35 km along the access track. Camping fees at both sites per night are: $3.30 per adult; $1.65 for children; $7.70 for families. Camper trailers/caravans: Recommended only for off-road camper trailers. Off road caravans NOT recommended (see road conditions section below). Total Distance: 300 km return from Alice Springs. Time Required: Allow up to 3 hours from Alice Springs, each way. 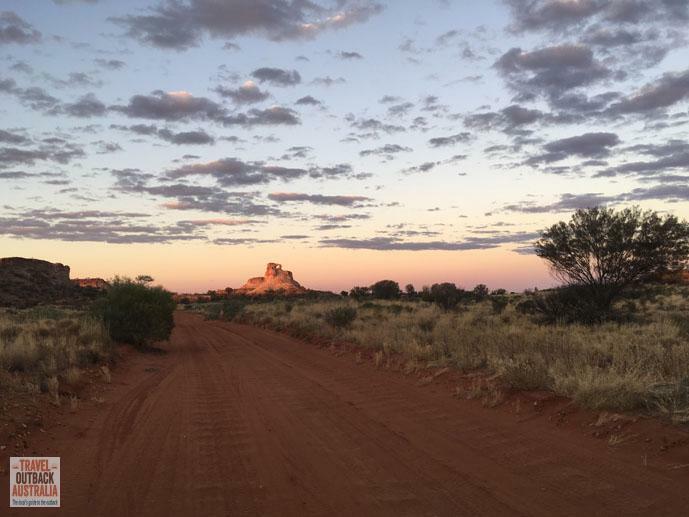 From Alice Springs: head south through the Gap and PASS the Stuart Highway/Adelaide turnoff as if you’re going to the airport. Just after the Stuart Highway turnoff, you’ll see another right hand turn along Old South Road to Maryvale and Chambers Pillar. This is a gravel road that you need to follow for around 107km to Maryvale. Once you reach Maryvale Station/Titjikala Community, follow the signs. From here it is 42km to Chambers Pillar. Alternative access from the Stuart Hwy: via the 60 km Hugh River Stock Route, then 34 km to Maryvale Station/Titjikala Community and 42 km from there to Chambers Pillar. Fuel & Basic supplies: Are available at the little store on Maryvale Station AND from the bigger store within Tijikala Community. Both are well signposted. Titjikala Community welcome the public to visit the store and the art gallery. Please remember that all sections of Titjikala Community are Aboriginal Land, and by law the public is only allowed to visit certain places (art centres and stores) without a permit. Road conditions on the Old South Road from Alice Springs to Maryvale Station (approx.107 km) vary from fabulous to appalling, and can change at certain times of the year. Corrugations, bulldust and erosion gullies are common. 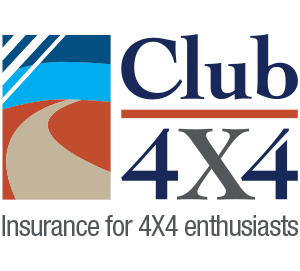 You’ll often find the road in poor condition after the Finke Desert Race in June. Most years, it gets a grade soon after the race, but the timing can vary. 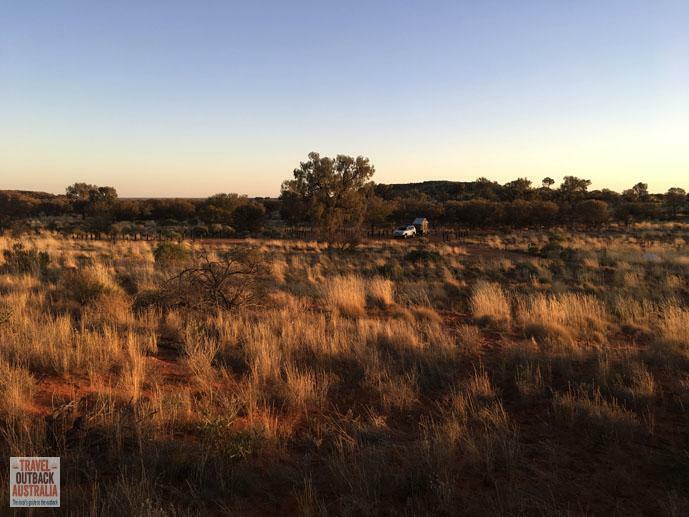 On the final 42 km past Titjikala and Maryvale Station, expect severe corrugations, bulldust ruts and deep sand – this is why we really do not recommend it for off road caravans. If you find this section of the access track to Chambers Pillar in better condition than this, count yourself lucky!